Empty-hand: The primary early technical influence on Aikido was the Daito Ryu Aiki-ju-jutsu of Takeda Sokaku, O-Sensei’s main teacher from 1915 to the 1930’s. O-Sensei also studied Yagu Shingan Ryu, mostly the Juijitsu component. Sword: As Takeda also held a teaching license in the Ono-ha Itto Ryu school of swordsmanship, and possibly trained in the Jikishinkage Ryu school, O-Sensei was probably exposed to these styles, although Takeda doesn’t seem to have taught the formal kata-based way of those schools, rather he used free-stle and kumitachi-based training. Takeda’s own formidable style was apparently eclectic, usually one-handed, and ambidextrous. O-Sensei’s first weapons training was probably the Jukendo he learned in the Army. He observed acutely, and participated in and/or observed many different styles of sword, staff and spear over many years. 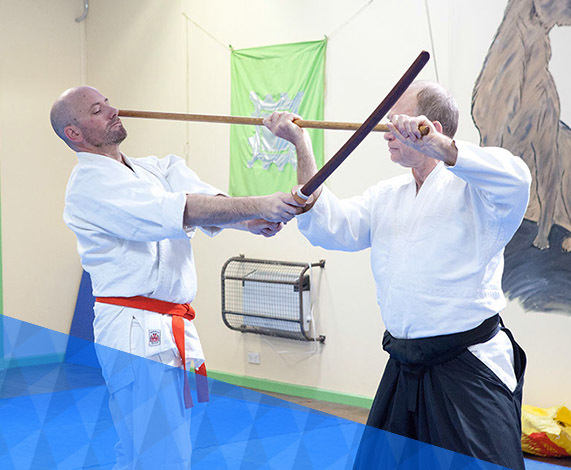 Spear and Jo: O-Sensei studied the yari/spear of Hozoin Ryu, which has some possible influence Aiki-jo. O-Sensei also studied an art known as Kuki Shin Ryu, one of the nine traditions of Togakure Ryu Ninjutsu, The Kuki Shin had some influence on Aiki-jo including a number of jo-dori within the Togakure Ryu that bear strong resemblance to Aikido jo-dori. He also studied jukendo (bayoneted rifle) while in the army in the early 1900’s, and certain disarming techniques bear resemblance to some of the jo-dori (staff disarming). O-Sensei adapted the traditional arts he learned to fit aiki and other spiritual principles, and, while resemblances can be seen to the old arts, aiki-jo and aiki-ken are now styles of their own. It seems clear that while the empty-hand (taijutsu) techniques are mostly from Daito-ryu, modified by O Sensei to optimise ki flow, the mindset and energy transaction in Aikido largely derives from sword and jo. The material on the technical background of aikido is from web research. Ueshiba, Morihei, BUDO, Teachings of the Founder of Aikido, Kodansha International, NY 1991. Saotome, Mitsugi, Aikido and the Harmony of Nature, Shambhala, Boston 1993. Omiya, Shiro, The Hidden Roots of Aikido, Kodansha International, Tokyo 1998. These three books would all be excellent additions to your library if you don’t have them already. Morihei Ueshiba was born on December 14, 1883, in Tanabe, Wakayama Prefecture. He was the fourth child and eldest son of Yoroku Ueshiba, a well-to-do farmer who owned two hectares (about five acres) of prime land. His father was a widely respected member of the local community who had served on the village council for twenty years, while his mother, Yuki Itokawa, came from a landowning family of noble descent. A delicate and sensitive child, his early life was shadowed by illness. He often daydreamed, identifying with the miraculous stories of the great Buddhist teacher Kobo Daishi of the nearby Kumano region. At the age of seven he began studies in the basics of the Chinese classics at a private school of the Shingon sect of Buddhism. He studied deeply for one so young and possessed an extraordinary interest in the meditations, incantations, and prayers of that esoteric sect. Concerned that young Morihei was overly mental in his pursuits, his father, a strong and vigorous man, also encouraged him to discipline and strengthen his body through the practice of sumo wrestling and swimming. Morihei graduated from Tanabe Higher Elementary School, and was admitted to the newly established Tanabe Prefectural Middle School at the age of thirteen. He left middle school before graduating, however, and went to the Yoshida Abacus Institute. Upon obtaining his diploma, he found employment at the Tanabe Tax Office, where his duties included the assessment of land values. Ueshiba moved to Tokyo in the spring of 1902 and established the Ueshiba Company, a stationery store large enough to employ several sales clerks. Meanwhile, a strong interest in Budo had awakened in him, and while he was in Tokyo, he studied both the Kito School of Koryu Jujutsu (unarmed combat) and the Shinkage School of Kenjutsu (techniques of swordsmanship). However, illness was to touch his life once again, and after giving his business to his employees, he returned home to Tanabe to convalesce. After his recovery Ueshiba married Hatsu Itokawa, whom he had known since childhood. The attitude of deep social responsibility that had been impressed on him by his father became stronger as he assumed the responsibilities of family life. Believing that change could occur only through action, Ueshiba became involved in many social reforms. At the age of twenty, Ueshiba enlisted in the military and served in the thirty-seventh regiment of the Osaka Fourth Division. His sincere and hard-working attitude and his extraordinary skill quickly drew the attention of his superiors. Easily regarded as the best bayonet fighter in the regiment, he displayed a technique so swift and clean that even the closest scrutiny of the judges could not detect how it was that each opponent was instantly sent flying. Promoted from Corporal to Sergeant during the Russo-Japanese War, the stories brought back by Ueshiba’s comrades of his great courage under fire made him a living legend, and among the troops he was respectfully called “the Soldier Kami.” Recognizing his talent and his capability to become a future general, his superiors urged him to attend officer training school, but because of the situation at home, Ueshiba left the military after four years of enlistment in 1907 and returned to Tanabe, where he worked on the family farm and participated in village politics, becoming the leader of the local Young Men’s Association. He took with him a certificate from the Yagyu School of Swordsmanship, obtained through study and practice during his off-duty hours, and the admiration and respect of all who had served with him. Upon his return to Tanabe, he channelled his skill and energy into social service and worked hard for the public good. During this period his father engaged the judoka Kiyoichi Takagi, who was then visiting Tanabe, to act as Morihei’s teacher, and converted the family barn into a dojo. As well as learning Judo he also continued to attend the Nakai Dojo and received a certificate from the Goto School. In 1912, the Japanese government announced the beginning of the Hokkaido Project, encouraging people to settle in this northernmost, undeveloped island. The additional living space and farming lands were necessary to the welfare of the nation, and the Russians were showing an interest in its strategic location. The adventure of a new life and devotion to Japan were to challenge Ueshiba once again. So at the age of twenty-nine, he organized eighty people from fifty-four households in the area, and together they moved to the village of Shirataki, in Monbetsu County, Hokkaido. The frozen land was harsh and inhospitable, unwilling to yield to the efforts of the new settlers. They were beset by storms and heavy snows, making their planned logging operations impossible. They tried to clear the land for cultivation, but the freezing rains drove them back into their hastily constructed shelters. Progress was slow, and the price paid in time and suffering was high. The first two years brought poor harvests and many hardships. Spirits were low, but Ueshiba encouraged the people, setting an example by his optimism and ceaseless hard work at the settlement, and his determined pursuit of negotiations for relief funds from every possible source. Two years later, in the fall, the land yielded its long-awaited harvest and the people began to feel that a permanent settlement was feasible. Each of the projects they undertook peppermint cultivation, lumbering, horse breeding, and dairy farming, was based on Ueshiba’s plan and proved to be an important factor in the development of Shirataki. The village took on new life, including the construction of a shopping street in Shirataki, the improvement of housing conditions, and the founding of a primary school. 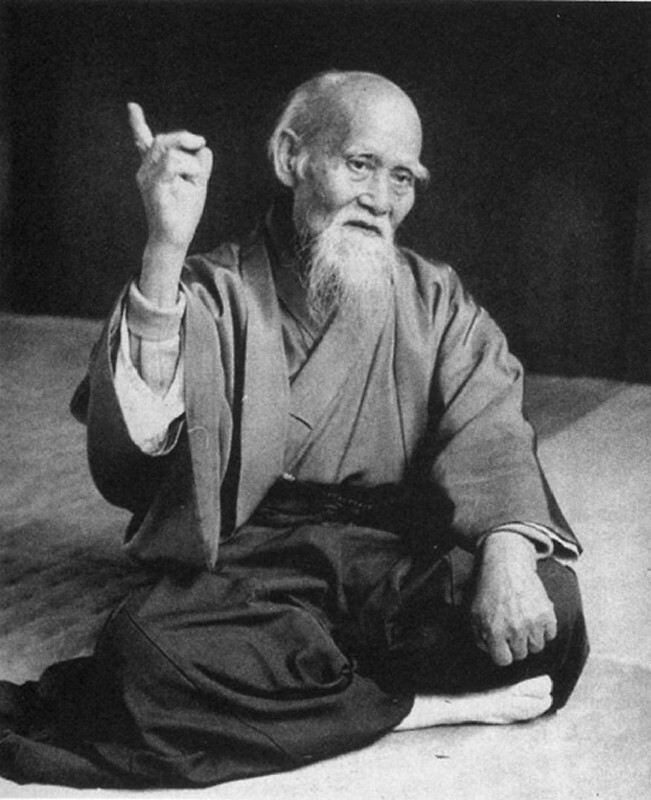 People began to call Ueshiba “King of Shirataki,” and when they had problems they came to him for advice and help. He served as a member of the village council and assisted in an exploratory excavation of underground mineral resources. During this period he met Sogaku Takeda, master of the Daito School of Jujutsu, who had occasion to pass through the area. Ueshiba was very impressed by Takeda’s technique and He subsequently trained intensely with Takeda, and gained a certificate in Daito-Ryu Aikijuijitsu. Owing to the expansion of the timber industry, Shirataki was fast becoming a boom town. But on May 23, 1917, the village was completely destroyed by a disastrous fire. The following spring found Morihei, who had been elected a member of the village council, totally immersed in the reconstruction of Shirataki. In July that same year Morihei’s eldest son, Takemori, was born. In November of his thirty-sixth year, Ueshiba received news that his father was in critical condition. Leaving Hokkaido, he gave his entire holdings to Master Takeda in appreciation for all that he had taught him. But on the way back to Tanabe, he was diverted by stories of a man named Onisaburo Deguchi of the new Shinto sect known as Omoto-kyo. Deguchi was a master of the spiritual practice called chin kon kishin, a Way of communication with the Divine Spirit of Kami through concentrated meditation. With the hope of a miracle, Ueshiba went to Ayabe, near Kyoto, to ask for prayers to alleviate his father’s critical condition. Acting on this advice, the Founder opened the “Ueshiba School of martial arts”. He taught mostly those who had some connection with Omoto-kyo, but his fame as a martial artist quickly spread among other people. He cleared and cultivated the land near the main hall of Omoto-kyo, led the self-sufficient life of a farmer, and put into practice his idea of the essential unity of Budo and farming. The study of kotodama, the spiritual function of the vibration of sound, had become a key aspect in his search for the true spirit of Budo, and gradually he began to bring about the unification of spirit, mind and body. In 1923, the Founder officially named his art Aiki Bujutsu. Aiki Bujutsu is the blending of spirit based on classical martial movement. jutsu is technique, as opposed to do, which is a path or way. Sadly, Morihei’s first year in Ayabe was marked by further personal tragedy: he lost both his sons through illness; Takemori died in August, aged three, and in September his second son, Kumharu, died, aged one. In the year following Morihei’s move to Ayabe, the instruction offered at the Ueshiba Academy gradually increased in range and depth, and word began to spread that there was an exceptional master of the martial arts living in Ayabe. The number of non-Omoto-kyo followers enrolling at the Ueshiba Academy began to increase, and many sailors from the nearby naval base at Maizuru came to train there. On February 11, 1921, the authorities suddenly clamped down on the sect in what later became known as the First Omoto Incident, and several people, including Onisaburo, were arrested. Fortunately the incident had no effect on the Ueshiba Academy. Ueshiba’s son Kisshomaru was born here in 1921. Over the next two years Morihei tried to help Onisaburo, who had been released on bail, to rebuild the Omoto-kyo. He took over administration of about nine hundred tsubo of land, which he farmed while he continued to teach at the Ueshiba Academy. In this way he was able to realize in his everyday life the belief that there is an essential unity between the martial arts and agriculture, something that was close to his heart and was to be a recurring theme throughout his life. From around this period Morihei’s practice of the martial arts gradually began to take on a spiritual character, as he became more and more absorbed by the study of kotodama. This led him little by little to break away from the conventions of Yagyu-Ryu and Daito-Ryu Jujitsu, and to develop his own original approach, using applied principles and technique together, to break down the barriers between mind, spirit, and body. In 1922 this approach was formally named “aikibujutsu,” but it became known to the general public as Ueshiba-ryu aiki-bujutsu. However, their expedition was ill-fated; they were victims of a plot concocted by another warlord, Chang Tso Lin, and when they reached Balan Dalai on June 20, they found Chinese troops waiting to arrest them. Morihei, Onisaburo, and four others were sentenced to death. Fortunately, just before they were due to be executed, a member of the Japanese consular staff intervened and secured their release and safe return to Japan. Morihei tried to resume his former life after returning to Japan in 1925, uniting the practice of the martial arts and farming by teaching at the Ueshiba Academy and working on the farm. He also became interested in sojutsu (spear technique), and continued his intensive practice of swordsmanship and aikibujutsu. He practiced day and night, utilizing his own unique methods of physical training and spiritual purification, and as his practice rose to higher levels, his martial skill took on an almost superhuman quality. Things were not the same, however. He had been deeply affected by the expedition to Manchuria and Mongolia, in particular by his experiences of facing death under gunfire, where he had found that he could see flashes of light indicating the path of oncoming bullets. It was also in this way that he realized that it would be better to name his creation aiki-budo, rather than aiki-bujutstu. (The substitution of the character do) in the place of jutsu changes the meaning from the martial art of aiki to the martial way of aiki). As aiki-bujitsu became better known and Ueshiba’s reputation spread, it attracted a number of distinguished followers, including Admiral Isamu Takeshita. In the fall of 1915 Morihei was invited to visit the admiral in Tokyo. He stayed at the residence of former Prime Minister Gombei Yamamoto, where he gave a martial arts display in front of a number of dignitaries, all of whom were greatly impressed. Morihei also spent twenty-one days teaching the martial arts at the Crown Prince’s Palace. In the spring of 1926 he again went to Tokyo at Admiral Takeshita’s invitation. He taught at the Imperial Court and Imperial Household Ministry, as well as teaching army and navy personnel and people connected with the world of finance. Morihei’s stay in Tokyo became somewhat prolonged, but in the summer he fell ill with an intestinal disorder and was forced to return to Ayabe to rest. In February 1927, having received an invitation from Admiral Takeshita, Morihei felt he had no alternative but to leave Ayabe for the third time. With Onisaburo’s blessing, he decided to make the move a permanent one and to devote his energies solely to establishing himself in Tokyo as a teacher of the martial arts. With the help of many supporters, in 1930 the temporary training facilities in Tokyo were enlarged to include a mat space of over fourteen hundred square feet. This training hall was called Kobukan Dojo and was located in the Wakamatsu district of Shinjuku, Tokyo. (Dojo is the place where the Way is studied; Kobukan indicates a search for truth by transcending ordinary human consciousness,) That year, Jigoro Kano, the founder of Kodokan judo, came to visit the dojo. Upon seeing Master Ueshiba’s supreme skill, he said, “This is my ideal in Budo”,- and sent two of his students to study. Many young judo practitioners came to study at Ueshiba School. One of these was Kenji Tomiki, the leader of the judo club at Waseda University. Tomiki later developed an aiki-jutsu-style offshoot of Aikido that included competitive matches. At the same time, Gozo Shioda, later the headmaster of Yoshinkan Aikido, studied as an apprentice to the Founder. It was not easy for members of the general public to join the dojo. Only those with recommendations from two reliable sponsors were allowed to become students. The practice was so intense and rigorous that the dojo earned the nickname “Dojo of Hell.” Many famous people, leaders in the military, government, business, education, and the arts, entered the Ueshiba School, and through these contacts, the Founder taught the police force and those connected with the Imperial Court. The year 1932 found Master Ueshiba extremely busy teaching and giving demonstrations of the art. Branch dojo were established in other parts of Tokyo, Osaka, and Kyoto. Aikido was quickly spreading throughout the country. A memorable visit in 1930 was that of Major General Makoto Miura. He was sceptical about the new budo, and visited the dojo only in order to defeat Morihei. The founder overcame Miura’s doubts so completely, however, that he enrolled as a student on the spot. Subsequently, at the request of the same major-general, Morihei became an instructor at the Toyama Military Academy. The next few years were extremely busy ones for Morihei, as he was teaching not only at the Kobukan, but also at many other dojo that had started up in Tokyo and Osaka. In 1932 the Society for the Promotion of Japanese Martial Arts was founded, and in 1933 Morihei became its president. In May 1933 a full-time training hall, called the Takeda Dojo, was set up in Hyogo Prefecture. Dozens of students came to live there, putting into practice the founder’s ideal of uniting the martial arts and agriculture. By the mid-thirties Morihei had become famous throughout the martial arts world. Even more than for his mastery of the various traditional Japanese martial arts, he came to public attention for the epoch-making nature of his own original creation, “the union of spirit, mind, and body” in aiki, formally called aiki-budo. During this period Morihei was practicing kendo very intensively at the Kobukan Dojo and a number of kendo practitioners frequented the dojo, including Kiyoshi Nakamura, who became Morihei’s son-in-law in 1932. In September 1939 Morihei was invited to Manchuria to attend a public exhibition of the martial arts. There he fought the ex-sumo wrestler Tenrya and pinned him with one finger. Morihei continued his visits to Manchuria even after the outbreak of the Pacific War, taking up advisory posts at various institutions, including Kenkoku University, with which he became particularly involved. His last visit to Manchuria was in 1942, when he attended the celebrations for the tenth anniversary of the founding of the Japanese-sponsored state of Manchukuo at the invitation of the Greater Martial Arts Association, and gave a demonstration of the martial arts in the presence of Emperor Pu’Yi. On April 30, 1940, the Kobukan was granted the status of an incorporated foundation by the Ministry of Health and Welfare. The first president of the foundation was Admiral Isamu Takeshita. In the same year the police academy where Morihei was teaching adopted aiki-budo as an official curriculum subject. With the outbreak of the Pacific War, one after another, the students at the Tokyo dojo went to the front, and Morihei’s son Kisshomaru, then a student at Waseda University High School, was given the responsibility of maintaining the dojo. Also in 1941 aiki-budo was assimilated into the Butokukai (a governmental body uniting all the martial arts under one organization). Morihei appointed Minoru Hirai to represent and manage the Kobukan in the Aiki Section of the Butokukai. It was around this time that the name aikido first came into use. During and after the Second World War, the Founder devoted himself to farming and sought the perfection of the ideal of Takemusu Aiki. Abiding deep within his heart was the belief that the path of Budo is the path of compassion; that the task of a true samurai is to make the world fertile for peace and to protect all life. In his sorrow for the suffering and destruction caused by the conflict, he spent long hours in prayer. Master Ueshiba had reached levels of spiritual awareness attained by very few, but still he continued his search for the power of truth. Having virtually no income, he lived in extreme poverty, training body and spirit and working the soil. Despite the worsening situation and the massive bombing of Tokyo by the U.S. Air Force the dojo escaped damage, but after the war it was used as a shelter by over thirty homeless families, so practice could no longer continue there. The headquarters of aikido was therefore moved to lwama, where Morihei continued to live quietly, farming and teaching young people from the surrounding area. After the war the martial arts went into decline for a time, and the future of aikido, too, was in doubt. However, Morihei had faith in the new aikido, and worked hard to establish its place in post-war Japan. When it seemed that the confusion prevailing in the immediate aftermath of the war had abated somewhat, it was decided to move the headquarters of aikido back to Tokyo. On February 9, 1948, the Ministry of Education granted permission to re-establish the Aikikai, with a revised charter. . Until that time, General Headquarters of the American Occupation had prohibited all teaching of Budo. But because of its emphasis on peace and the seeking of truth, Aikido was allowed to resume an active part in society. The name of the dojo was changed from Kobukan to the Aikikai Foundation, and it was headed by the Founder’s son, Kisshomaru Ueshiba. During that time the main dojo in Tokyo was renamed the Ueshiba Dojo and World Headquarters of Aikido. After the establishment of the Aikikai, Kisshomaru was given the responsibility of consolidating the existing organization and planning its future development. Meanwhile, Morihei remained in lwama, absorbed in contemplation and martial arts practice. From time to time he would come to Tokyo at his students’ request, lecturing on Aikido principle and teaching technique. In 1954 the headquarters of aikido was moved to Tokyo, and the Tokyo dojo took the official title of the Hombu Dojo of Aikido. In September 1956 the Aikikai held the first public demonstration of martial arts since the end of the war on the rooftop of the Takashimaya department store in Nihombashi, Tokyo. The demonstration lasted five days, and made a deep impression on the foreign dignitaries present. Morihei had been adamantly opposed to giving such public demonstrations, but he understood that Japan had entered a new era, and consented in order to further the development of aikido. In 1959, as public recognition of Aikido took root, 0’Sensei’s fame spread both within Japan and abroad. There was a marked increase in the number of people coming to the dojo seeking instruction, and some of the leading students began to take an active part in spreading his teachings overseas. On January 15, 1969, Morihei attended the New Year’s celebrations in the Hombu Dojo. Although he appeared to be in good health, his physical condition rapidly deteriorated, and he passed away peacefully on April 26, 1969. On May 1, the founder was given a posthumous award by Emperor Hirohito. His ashes were buried in the cemetery of the Ueshiba family temple in Tanabe. THE DAITORYU is believed to have originated within the family of Emperor Seiwa and to have been greatly developed by one of the emperor’s descendants, Shinra Saburo Minamoto no Yoshimitsu, in the eleventh century. Through his careful study of human anatomy-he made a point of visiting battlefields and execution grounds to examine and dissect the bodies of war dead and executed criminals-Yoshimitsu determined which were the most effective strikes, blows, holds, joint locks, and pins. To fathom the mysteries of aiki, or harmonized energy, Yoshimitsu spent hours observing a female spider trapping prey in her web. Furthermore, he was a talented musician, and while accompanying dancers on his sho (a type of wind instrument), he gained insight into the nature of good rhythm and smooth transition between movements. Yoshimitsu incorporated all of this knowledge into the martial art he had been taught by family members and then passed on to his sons this improved and expanded system-which came to be known as the “Daitoryu,” after the name of one of his residences. Yoshikiyo, his eldest son, settled in the village of Takeda in present-day Yamanashi Prefecture and founded the Takeda branch of the Minamoto clan. The Daitoryu tradition of Yoshimitsu was thereafter handed down in complete secrecy to successive generations of the Takeda family. Near the end of the sixteenth century, the family, led by Kunitsugu Takeda, shifted its main base to the Aizu district in present-day Fukushima Prefecture. There the martial art system became known as o-shiki-uchi, or “practice in the room,” and alternatively as an o-tome-bujutsu, or “inside- the-clan martial art”; both these terms are thought to suggest the great secrecy with which the Daitoryu techniques were guarded. The art was secretly transmitted to the samurai of the Aizu domain until the fall of the Shogunate in 1868. It was not until the nineteenth century-when Sokaku Takeda began to teach the Daitoryu to the public-that the art became widely known. Sokaku was born in 1860 in Aizu, where he received instruction in the traditional o-shiki-uchi arts of the Aizu clan from his relatives and from Tanomo Saigo (1830-1905), the last minister of the Aizu domain. Sokaku is considered the thirty-fifth Grand Master of the Daitoryu tradition stemming from Kunitsugu Takeda. In addition to the Daitoryu system, Sokaku studied many other martial arts and acquired firsthand combat experience in street fights all over the country. Around the turn of the century, Sokaku began teaching the Daitoryu system-which by then included some new elements that he himself had incorporated-to select groups of military officers, police officials, and aristocrats. Sokaku was based in remote northern Japan but made occasional forays to Tokyo and western Japan. In the course of his travels, Sokaku defeated all challengers. It is said that thirty thousand martial artists received instruction at Sokaku’s hands. Of this vast number, only twenty or so received formal teaching licenses from the Daitoryu Grand Master. Several of Sokaku’s students themselves became extremely distinguished teachers. Yukiyoshi Sagawa (1902-1998) was one of Sokaku’s earliest students. He began studying with Sokaku in Hokkaido when he was just twelve years old, and continued this training for many years. Sagawa eventually settled in Kodaira, a suburb of Tokyo, and established a dojo (training hall) there. Sagawa was widely considered to be the premier Daitoryu exponent of the second half of the twentieth century. Another early student of the Daitoryu was Kodo Horikawa (1895-1980). Horikawa began his training in Daitoryu under his father, one of Sokaku’s first students, and then with the Grand Master himself. Horikawa lived all his life in Hokkaido’s Kitami district, where he disseminated the Daitoryu teachings. Takuma Hisa (1896-1980) was Sokaku’s principal student in western Japan. He is believed to be the only one of Sokaku’s students to have received the complete transmission of all the Daitoryu techniques for unarmed and armed combat. After university, where he had been a champion sumo wrestler, he taught Aiki jujutsu Daitoryu for many years in and around Osaka. Tokimune Takeda (1916-1993), Sokaku’s second son, established a Daitoryu aiki budo headquarters in Abashiri, Hokkaido in 1953, subsequently assuming leadership of the Daitoryu tradition. In this role, Tokimune established an archive for Daitoryu-related material, codified all of the Daitoryu techniques, and established branch dojos throughout Japan. Morihei Ueshiba (1883-1969) was Sokaku’s most famous student. Morihei first met Sokaku in 1915 in Hokkaido, and trained under him until 1922, when Morihei in turn was licensed to teach. Under the influence of Onisaburo Deguchi (1871-1948), charismatic leader of the Omoto-kayo religion, Morihei adopted and simplified the Daitoryu techniques and added a prominent spiritual dimension to create the art of Aikido-which in recent years has become extremely well known around the world and gained a large international following.